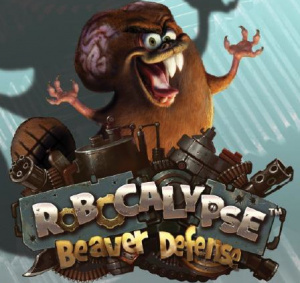 Vogster Entertainment has just announced their new upcoming title Robocalypse - Beaver Defense that will be coming to the WiiWare service this summer. You can check out the official press release below for more information on the game as well as some of the unique features the game will employ. NEW YORK, NY, April 7, 2009 -Vogster Entertainment, an international developer and publisher of interactive entertainment, today announced a new addition to its critically acclaimed, robot warfare-themed Robocalypse™ franchise with Robocalypse - Beaver Defense. The new game is a “tower defense” style action title planned as a WiiWare™ download for Europe and North American customers in summer 2009. Tower Defense Strategy - Stop the enemies before they get to your HQ and destroy it. Hilarious Storyline - Written by Jay Lender (SpongeBob Squarepants) and Micah Wright. Hero M.I.T.E.! (More Important Than Ever!) - Directly control one of the Hero robots - moving battle towers that are the Thermidoom company's pride and joy. Outrageous Weapons - Heroes and towers can unleash spectacular weapons like flame throwers, chainsaws, and falling anvils - all to fortify the HQ. On-the-Fly Upgrades - Automatically use defeated enemy scraps to apply upgrades, build new robots, and place more towers. Online Competition - Internet play on the Nintendo Wi-Fi Connection supports up to four (4) players. 2 Multiplayer Modes - "Last Man Standing" (last remaining HQ wins0, "Best Defender" (play against time for the most points). 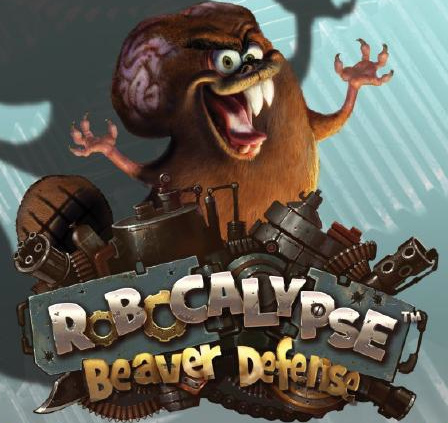 Robocalypse - Beaver Defense will offer madcap weaponry and uproarious destruction in a tower defense-style game. Set in a world of wise-cracking, battling robots, players will need to create and strategically position static and mobile defenses to stop the waves of enemies that are intent on destroying the player’s HQ. Robocalypse - Beaver Defense will offer upgradable skills, weapons, hero units and defenses to be used in single-player and up to four-player multiplayer mayhem. It is the follow up title to 2008’s critically received Nintendo DS™ real-time strategy game, Robocalypse. We'll have more information on Robocalypse - Beaver Defense as it becomes available, as well as a full review once the game hits the WiiWare service this summer. As if we didn't have enough reasons to love beavers. Edit: Oh the point of the game is to stop an evil beaver? As if we didn't have enough reasons to hate beavers. @AlexSays-Now there's an innuendo. Bravo. Though after looking at those pictures I don't even see any beavers. Misleading title... for the loss. But I'm all for strategy games though and online could be nice. And it's a follow-up to Robocalypse which did fairly good. The picture's caption made me lol. Wonder why they didnt make it a rts like the ds one. (i gotta pick that up some time) wiiware should be able to handle it. lol I thought this was a Wii game not a WiiWare game. Anyway this game sounds more interesting then Military Madness. I might get it if the reviews are good . Wow, looks pretty cool and interesting! I love beavers too! Makes me wish they'd bring back the Angry Beavers. Yeah the Angry Beavers were so awesome. I miss Dagg. I'm not the biggest tower defense fan in the world, but this does look interesting. WHAT?? An online game in an underused genre that's from someone other than Hudson? Be still my heart! Sounds very worthwhile, heard the original was pretty good. Nice one. Another insta-buy for me by the sounds of things. Doesn't look like one I'd be interested in. However, it has potential to be a good game. @Corbie- That was a good show. As for the game, I might get it just for the Wi-Fi play alone. I haven't really played a tower defense game, but I've seen other people play similar games, and it looks better than Crystal Defenders, so I'll keep my out for this one. Wow, there are some fairly good games being announced lately. I love tower defense games, so I'll be looking forward to this one.